My Top 8 Twitter Chats for Educators – an update! 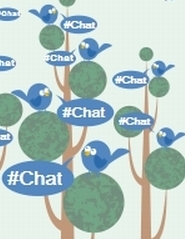 A few months ago I blogged about the 8 Twitter Chats that I love and visit regularly. As a globally connected educator – this list is constantly being changed, adjusted and tweaked as I explore the vast world of educational Twitter chats. #nt2t – NT2T stands for “New Teachers to Twitter”. It is an open chat for teachers who are new to twitter and a must visit to learn more about how to use twitter and chats more effectively. Full of veteran twitter users to support you and newbies just like you, it is a chat you just can’t miss. Learn to tweet, who to follow and access the very best resources to support teaching and learning. Join the #nt2t chat crew every Saturday 9-10am EDT. For more information, click here.NOW ….. for my 3 new additions to my top Twitter chat list! #aussieED – One of the most exciting things to come out of Australia since Russell Crowe (or is he a kiwi?). #aussieED has quickly become the go to chat for all Southern Hemisphere educators. The #aussieEd team consists of several Australian based educators who have a diverse range of skills and knowledge in Education. Their chats are on every Sunday at 8.30pm AEST (6.30am EDT). For more information, click here. #tlap – Teach Like a Pirate by Dave Burgess is a phenomenon that is sweeping the educational globe at the moment and the same goes for the #tlap twitter chat. When I can (time zone issues) I jump into the #tlap chat. This chat is an action packed hour of inspiration, practical techniques and innovative classroom ideas. The idea is to help engage your students and staff through the way you teach. A must chat for those with a passion to inspire! This chat is on every Monday night 8pm CST (9pm EDT). For more information, click here. #asiaED – This is a brand new chat out of Asia with the intention of engaging and inspiring Asian educators to come together and connect with educators from around the world. It is a slow chat style (which I love) where there is a new moderator from Asia every week and they post 1 new question every day so that everyone can engage no matter the timezone. It is all about connecting Asian educators with each other and the world so get connected no matter where you live. You can find the question each day here and join in by using the hashtag #asiaED. For more information, click here. So there we have it – my current list of 8 must follow chats. For the interests of an engaging and enlightening article (and not to overwhelm people) I have not included every one of the chats that I frequent. Twitter chats are personal preference, so I would love to know: “What are your favourite chats?” – please share below in the comments and via Twitter and please do share with your PLN. #edchatnz. Is a New Zealand based Twitter chat every second Thursday and attended by international educators young and old and facilitated by the fantastic Danielle Myburgh @MissDtheTeacher. Topics include the changing pedagogues, MLE’s, and all the wider education topics that are current and topical. Thanks for sharing the great chat options. I appreciate knowing about all of them. I am learning and this will help. https://padlet.com/mjj61244/fen18okv8nkw. We also shared “badges” with those who attended the chats using DMs. On August 28th at 10 PM EST we will give away books to those who earned the most badges through their consistent participation in chats. As fall approaches we will shift the twice weekly chats to weekly (Saturday at 9:00 AM EST) and spotlight the following: “Book Tasting” sharing about the books they are currently reading, “Porch Swing” sharing strategies and resources from books they are reading, “Shine Spotlight” brag about what is being implemented in a teacher’s school from an idea or concept they have read about and, finally, continuing with “Guest Authors” the last Saturday of each month. With educators learning often begins with books they are reading and our hope is that by providing a weekly chat on Twitter their learning will soar to new levels and increase chances of implementation. We hope all will join in the excitement!